Many people posting comments about the Open Market have mentioned ‘The Blind Man’ who had a stall there. Maurice Raff, ‘The Blind Man’, was my grandfather. He had been a tailor in London’s East End until he went blind overnight, in about 1937. At the time his wife was told that he would not live for more than six months. He, his wife and their three children, Dorothy, Barbara and Jack (2 other children had died) moved to Brighton in 1939. As there was very little by way of Social Security in those days, times were very hard for them. Grandfather loved running his market stall where he sold the 6d toys people remember, as well as some at the exorbitant price of 2/6 just before Christmas. He also sold lengths of material and haberdashery like buttons, zips, thread and other items. My first ‘job’ was working on his stall on Saturdays. Mothers would often send their children to ‘look at the toys’ whilst they went shopping, although they were not going to buy anything from him, which sometimes meant that ‘paying customers’ could not get near the stall. When that happened, he would move slowly along the front of the stall ‘tidying up’, pretending not to know that anyone was there, to clear some space. He was very proud to be known as ‘The Blind Man’ and eventually died in his 80s. His wife and son have now also died, but his daughters are both still alive. If you remember Maurice and would like to share your memories with us, please do leave a comment below. I remember Maurice Raff very well as a kid. In the Open Market before they “modernised” it Maurice had a stall near to the Level end. After the modernisation he and my dad shared a stall together. I sometimes got Mr Raff’s tea for him. The older market was colder and sort of ramshackle but it had a lot more of a homely feel about it. Mr Raff was a very nice man and despite his blindness his hearing and other senses were as sharp as a razor. Very memoriable times. Mike Peirson. 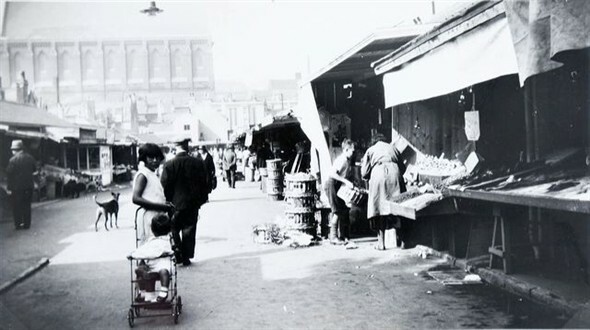 I certainly remember the market as I started life, 1946, just a couple of streets away from the market in Shaftesbury Road till I was three. After that we moved to Hollingbury but the Open Market bus stop was our regular stop for shopping, going to the Co-op bank in London Road, or visiting grandparents etc. I also remember taking lunch sometimes with my mother at a cafe round the corner from the market in Baker Street. My favourite was the steak and kidney pie with mash and veg. It was a very popular and delightful cafe with, I believe, Italian owners. Lucy serving, her husband cooking and one of their parents helping out in the kitchen. The whole atmosphere was cosy, warm, busy and charming. Like something out of an old movie. I have no recall what the cafe was called but there regularly came a blind gent for his meal. Lucy would deliver his plate and explain, pie 12 o’clock, veg 3 o’clock, potatoes 6 o’clock. Or similar to that. I am assuming it was the famous stall man catching a warm meal in the day. I could be wrong but maybe someone else remembers more to add on from this. Thanks for the article. I’ve mentioned Maurice Raff a couple of times in other posts on MyB&H, but would like to pay my respects to him and to his family here on Sara’s excellent post. I recall the first version of his stall when the Market still looked like the picture above, early to mid-fifties. Mother would occasionally buy me a plastic toy of some sort with the legend “Made in Japan” on it – something we viewed with some derision then, not anticipating the conquest of plastics as the predominant industrial raw material and the rise of Honda, Sony, Yamaha, Panasonic et al! I too preferred the comfortable Victorian scruffiness of the old Market to the ordered neatness of the new. Encouragingly though, on my most recent visit from here in the West Country about two years ago I had cause to use the public convenience at the London Road end of the Market and found it reassuringly unchanged from the fifties. Even the attendant chappie leaning against the doorframe of the Gents looked – and sounded – like the man who looked after the lavs half a century ago! Any relation, I wonder? I remember the blind man, he had excellent hearing and would know if you touched anything on his stall. Does anyone remember Mr. Peirson who had a little costume jewellery stall in the Open Market around 1954? He had a daughter Geraldine. I would love to make contact with her again. I must have seen Maurice Raff on frequent vists to the market in the 40s and 50s. I went to the same school as the late Jack Raff who lived at the end of a row of council houses (I think). Their house was next to a twitten that ran all the way across Patcham and faced on to Winfield Avenue. I think the Raffs’ were a Jewish family but please correct me if I’m wrong. John C Snelling. In reply to two of the earlier, interesting comments – yes, my Grandfather often went to the cafe in Baker Street, where the waitress would describe what was on his plate as “meat at 12 o’clock” etc, and my sister and I have happy memories of being allowed to go their by ourselves when we were children and visited him with our Mother (his daughter Dorothy). John Snelling, who remembered my Uncle Jack was right as well – we are a Jewish family and they lived in Patchdean at the end house, next to the twitten that ran up the hill alongside the school grounds. Jack and his Sisters, Barbara and my Mother went to School there during the War. Sometimes the school-children had to go into the air-raid shelters under the School when enemy planes were flying over Brighton on their way to a bombing-raid on London, and wait in there (still doing their lessons) until the planes had returned from their mission and the ‘all-clear’ sounded. Not such ‘good old days’. Sadly. Uncle Jack died a few years ago and my Mother, Dorothy, died in January 2013, so the only remaining ‘child’ of Maurice Raff and his wife, Rose, is Barbara, who has lived in New Zealand for many years, though she has come back to visit, most recently in Summer 2012. I would be interested to hear if anyone else remembers the family from those days. Sara, Very sorry to hear of the death of your Uncle Jack. I’m sure we both went to Patcham from age 5 until ?. He was a lovely lad. My mother Celia and dad Charles knew Maurice who had quite a long life. My mum died at 102 in 2006 and is buried with my dad (died 1964) at Old Patcham Church. Maurice Raff was my grandfather too, I am Jack’s son Jonathan. I remember his big long coat and beard and playing on the stall. I was pretty young but have some memories of it all and would love to contact Sara about her great piece on Maurice. Jonathan – I was so pleased to hear from you. Please contact me at raff-family@outlook.com. I do not have a computer so I use one at the library which means that I will not see your email as soon as you send it, but I look forward to hearing from you. I am Sara Rosen’s younger sister, Angela (now Colliss), and so Maurice Raff was also my lovely grandfather. I too have memories of “helping” him on his stall aged about 5. For some time he shared the stall with a man named Fred who engraved pet tags etc. I believe he had a wooden leg, which I always found a bit creepy! I am delighted that so many people remember Grandpa and I am particularly pleased to read the comment by Jonathan Smith, our long lost cousin, and do hope he gets in touch. How our childhood memories are so different sometimes in reality. My dad spent his final years at the stall he shared with Maurice Raff after the old market was refurbished with new stalls etc. Maury, as my dad called him, always wore a Homburg hat. Just for Angela Colliss, Fred was my dad and he did do engraving and selling home-made jewellery from his stall. He was a disabled ex-serviceman and also an accomplished artist and watchmaker. He wore an artificial leg that was the issue at that time, it was made of aluminium and not wooden as Angela thought. Sorry that the leg made you feel creepy Angela, it never worried us kids. I remember the artificial leg giving my dad a lot of pain sometimes. Message for Jonathan Smith – I am Maurice Raff’s daughter and would love to contact you. There has been a separate page done about my Father which you can see here. Please contact me at tailormade1@xtra.co.nz. As kids, my sister and I remember the Blind Man, and as previously said, it was a great treat to go and visit his stall to see the toys. I remember the stall was at the top end of the market on the left hand corner, if you came in from Ditchling Road (pre 1962 and the new market being built). We bought a few toys if we had the money, but mostly looked at them, and he never minded us just looking, knowing the mums did not have a lot of money in the 1950s and early 1960s. He was always very nice, and I remember the hat and dark glasses – I seem to remember very dark coat and hat. Most of us kids were very good and just looked at the toys, but he was quick if anyone tried to take a toy occasionally and his hands would spread out flat and sweep out over the items on the stall so the child knew he or she couldn’t pull the wool over his eyes! He must have had brilliant hearing and spacial awareness! He will always remain as one of my best childhood memories! It is nice to hear a little about the man behind the glasses and who he was! I have scanned this picture many times but today I noticed the pale white building at the far end of the picture. What building is that, does anyone recall? I have been assuming we are standing at the Ditchling Road end and looking down towards London Road. Hi Sara, I thought you may be interested to know the school children have been doing a show featuring your grandfather in the Open Market as part of Brighton Festival. I am Maurice Raff’s surviving daughter in New Zealand and am absolutely delighted to say that the family have just heard from Jonathan Smith, Maurice’s long lost grandson, Jack’s son, who now lives in Patcham. What a thrill for us that he has made contact after all these years and I’m sure we will all have a lot to say to each other. I have just seen the notice written in by Lee Mack regarding the school children having done a concert at the Brighton Festival depicting my father and the Brighton Market and I would very much like to hear more about that please. Living so far away, I can’t be sure which “Lee Mack” it is that has written in. The only one I know of is that fabulously funny comedian that I so enjoy watching on TV in series like “Would I Lie to You?” all this way away. Could it possibly be him, or have I got it all wrong and it’s another Lee Mack? Was the show videoed by any chance? Hello Barbara, I have just read your comment and I too was wondering if it is the Lee Mack? I am so pleased that Jonathon has been in touch. I also remember the blind man’s stall. Born in 1946, money was very tight in those days and people did really struggle to survive. Mum would always shop in the open market and London Road. In and out of different shops because things were a penny cheaper “over there” We must have criss-crossed London Road countless times to get the best value to stretch the budget. But I did love the open market as it originally was in the ’50s. From the blacksmiths on the left as you came in, to the toilets on the right. I also remember the big iron ring in the wall to tie the horses up, I assume. Most of all I loved the atmosphere, the shouting, the banter and the smell. It certainly was a far cry from where the posh people shopped in Western Road (that’s how we saw it in those days). But the blind man’s stall was my main attraction. It was mainly cheap plastic toys and as you might expect, they mostly had Made in Japan stamped on the bottom as stated above. But it was also a treasure trove of excitement for us kids. One thing that sticks in my mind was they actually sold plastic flick knives!! “Juvenile Delinquent” starring Jerry Lewis had recently been on at The Gaiety in Lewes Road and all us kids wanted a flick knife. At ten or eleven years old plastic would have to do and I even had to hide that from Mum and Dad!! They didn’t find it so clever at school if they saw one it was gone forever even though it would be difficult to cut paper let alone anything else! I also remember one time that me and my mates came walking through the open market from the Level end aged about eleven, I guess the tallest of us would have been about 4′ 10″ dressed in our cheap plastic leather-look jackets and cheese cutter caps with a buckle on the back, blue jeans and winkle pickers, chewing gum and all swaggering along like we ruled the world. One of the larger fruit and veg stalls on the right-hand side had a few men working on and around it. I think it was “the guvnor”, a large portly bloke who saw us first. “Watch out lads, here they come”, he shouted and they all looked at us and ran and hid behind the display and the counter! We didn’t know whether to laugh or cry! But that’s how it was in there. Great people who didn’t take anything to seriously. Absolutely loved the place.